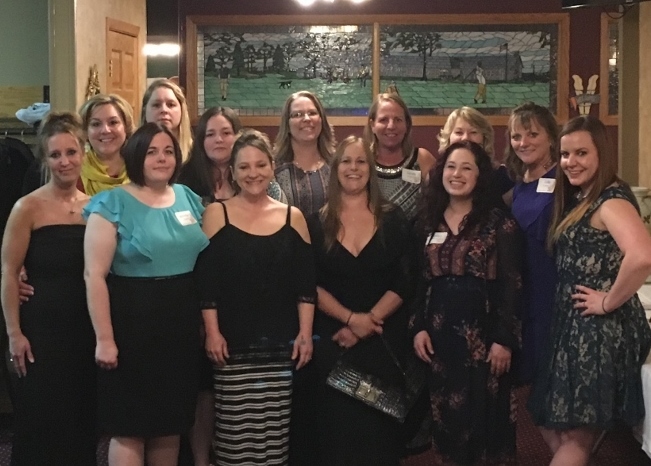 Ecumen Hospice-Litchfield Staff (front row, left to right) Missy Kielty, Jennifer Nieland, Jen Welte, Alex Reimer, Janice Kalkbrenner, Brittany Dobson; (back row, left to right) Nicole Larson, Amanda Becker, Stacy Anderson, Beth Kern, Sandy Dougherty, Shelly Hank, Judy Loecken. Ecumen Hospice-Litchfield held its annual hospice dinner and silent auction April 7, 2017, and raised about $11,000 – money used to help pay for care and supplies that are not reimbursable by insurance. The fundraiser is a Litchfield community tradition going back 28 years. Don and Ann Konietzko, Ecumen Hospice-Litchfield’s first volunteers, were the hosts for the evening. Don served as master of ceremonies for the event, announced the winners and ran the live auction. This year 177 people attended, and there were 153 auction/raffle items.